If you’ve been paying attention to the recent updates to Yummy you might be wondering where the companion update for Yummy Browser is. And the answer to that, I’m afraid, is that it’s not coming. Unfortunately the time has come to say goodbye to Yummy Browser. Soon it will disappear from the App Store and you will no longer be able to “buy” new copies (though you will be able to re-download it if you already have a copy). Why am I taking this step? I created Yummy Browser with two objectives in mind. Firstly as a way of testing the effectiveness of mobile advertising and secondly as a “lite” version, a way of letting people try Yummy before paying for the full version. Neither has been a great success. Advertising just isn’t the panacea that many people seem to think that it is. My impression is you need of the order of a million regular users before it starts to make economic sense (or perhaps a smaller but more targeted audience). It won’t surprise you to learn that Yummy Browser has somewhat less than that. And back in 2008-9, it was the received wisdom that a “lite” version was the way to get around the fact that Apple didn’t provide a way for users to trial software. Well, they still don’t have that facility and, while some developers have had success with that strategy, it has not worked brilliantly with Yummy. It’s difficult to calculate exact values since Apple provide no analytics but what I can say is that on many days, despite being free, Yummy Browser gets fewer downloads than Yummy. More tellingly — and not entirely unexpected — more people who buy Yummy actually keep using it. 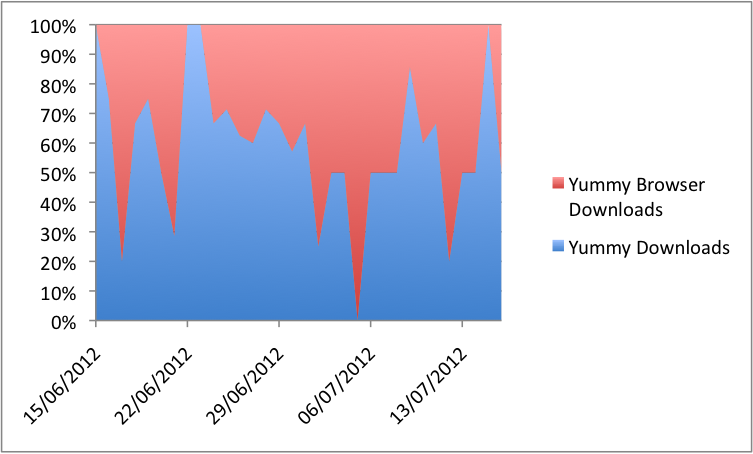 When I release an update I get a large number of downloads for Yummy but far fewer for Yummy Browser. 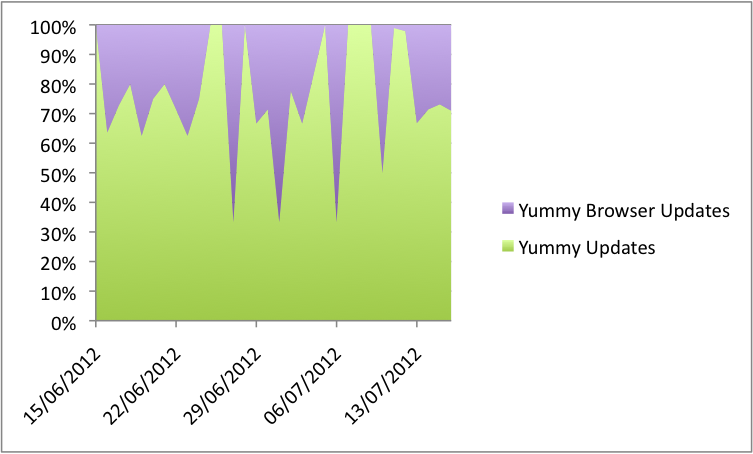 The spikes in the purple below represent updates from Yummy shrinking rather than big increases in updates of Yummy Browser. And finally, Yummy Browser has not been available for download in the US for a while now and it appears not to have affected downloads of the paid version there. Yet despite little revenue, fewer downloads and less “sticky” users, supporting and developing Yummy Browser takes away effort that I could be putting into Yummy, www.cut, Rootn Tootn and other app ideas. What I’m trying to say with all this text and the graphs is that this is not a decision that I’ve taken lightly, but I think it will improve things for users of all Wandle’s other apps. And let’s not forget that Yummy Browser won’t just stop working today.